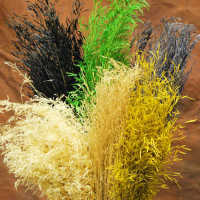 Broomcorn is an interesting and colorful addition to cornucopias, wreaths and garlands. Broomcorn is beautiful when tucked in the branches of a Christmas tree, with the seed heads colorful and dangling through the evergreen boughs. Broomcorn looks gorgeous in a vase, and lovely in a bouquet. 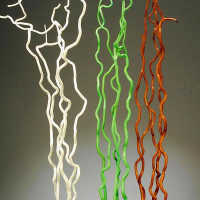 Bringing broomcorn into your home or office is bringing color, vibrance, nature and history into your home or office! 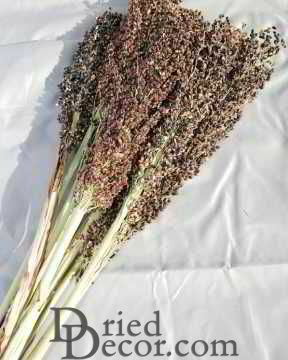 Broom Corn has natural coarse seed head. 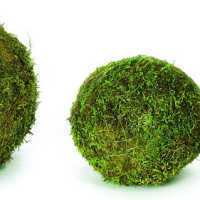 It is perfect to add volume to your floral projects. Broom Corn stocks and the leaves of the plant look like regular corn, however broom corn is not corn, but is sorghum. The stocks are woody with a dry pith. 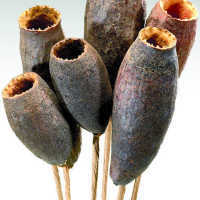 The fibers of broom corn are branched toward the tip, and the flowers and seeds are borne at the tips of the small branches. 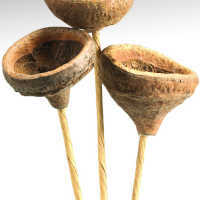 The seeds of the broomcorn are boat shaped and enclosed in the colorful glumes that make them so fantastic for decorating. 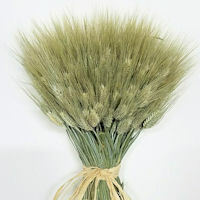 Broomcorn is a perfect home and office decor choice. 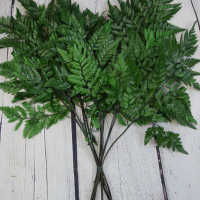 The plant is picked at the peak of perfection, and naturally dried to last for years in any arrangement. Whether on its own or mixed with bayou grass or ornamental wild grass, or added to a variety of dried flowers, Broomcorn will add texture, color and interest. 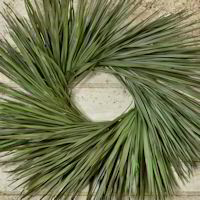 Broomcorn is an interesting and colorful addition to cornucopias, wreaths and garlands. Broomcorn is beautiful when tucked in the branches of a Christmas tree, with the seed heads colorful and dangling through the evergreen boughs. 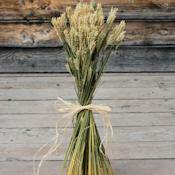 Broomcorn looks gorgeous in a vase, and lovely in a bouquet. 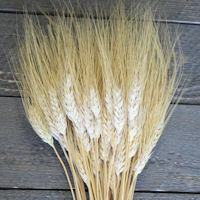 Bringing broomcorn into your home or office is bringing color, vibrance, nature and history into your home or office! 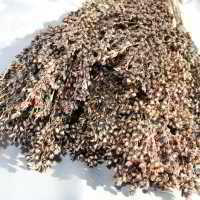 Broom Corn has natural coarse seed head. 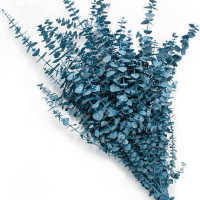 It is perfect to add volume to your floral projects.